On dark and gloomy days with nothing but rain, I pick my projects with care. I needed a project that kept me indoors, required little sunlight, and, most important of all, could be done with what I had on hand. 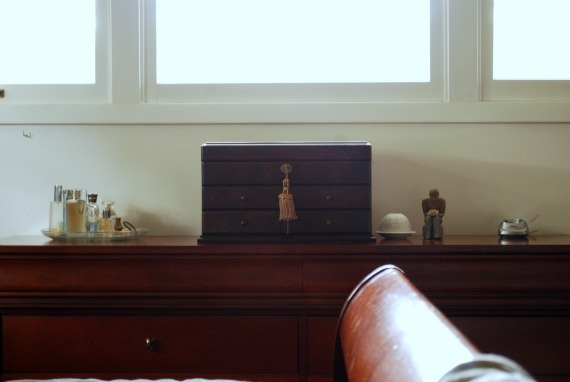 The top of our dresser and the jewelry box that calls it home met all my requirements. I had the Mister buy me the jewelry box as a birthday present when The Bombay Company went out of business in 2008. (Look! They were bought and are now a privately owned Canadian company.) He thought it was a strange request, and asked me twice if I was sure. Of course I was sure! I was sure I couldn’t fit one more earring in our thin, barely functioning top dresser drawers. I don’t know if it’s operator error, a product malfunction, or the way it’s supposed to be, but the drawers open about 2/3 of the way out. 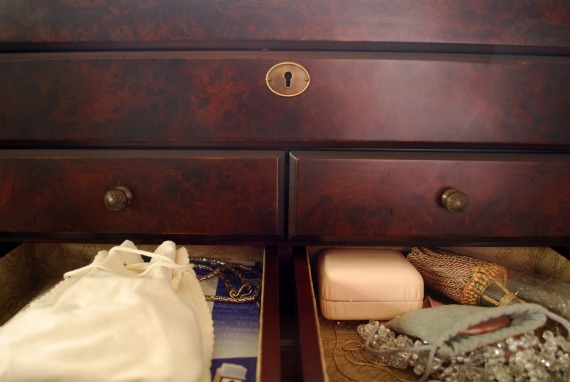 It’s difficult to store items in the drawers, and impossible to easily reach anything in the back. That’s why they look like this. The perspective is deceiving in this picture. They open about 6 inches, and yet are the same depth as the rest of the drawers. We’ve looked for locks, stops, and safety tracks but haven’t found a thing. I guess top drawers aren’t meant to pull out all the way. In 2008, it didn’t occur to me to purge our top drawers. I was just starting to acquire an interest in simple living, voluntary simplicity, and intentional living. Buying another container to contain more stuff seemed logical, and by the time I realized it wasn’t, I wanted to tackle areas with more impact. So the evidence of a life lived somewhat chaotically continued to pile. The usual. Empty. Separate: Trash; Donate; Keep. The wonky drawers received the same treatment. 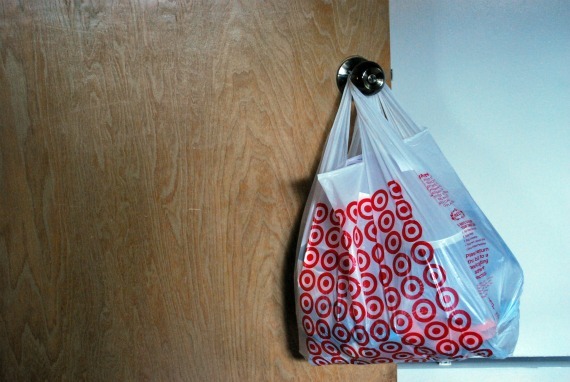 Unlike most of my projects that require 800 trash bags, empty boxes, or laundry hampers, I was able to collect all the trash in one Target bag. If you consider an entire Target bag of trash collected for years in two drawers and a jewelry box, it’s not nearly as comforting. 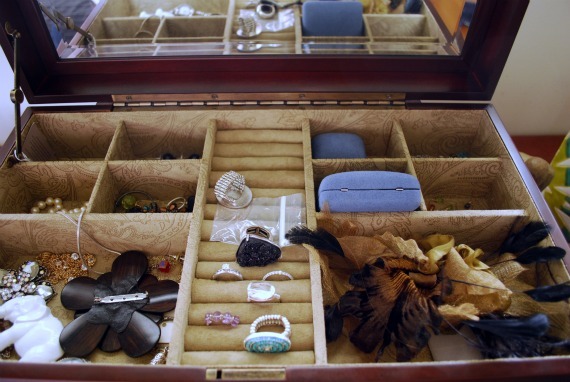 I could easily get rid of the jewelry box and fit everything inside the two drawers, provided I find jewelry compartments to make containing them and accessing them easy. I held off on that because (1) it would be a budget breaker and (2) I’m not sure that is the route to take. I want to think about it for a while and see what would make most sense. I’m excited I have room for more jewelry! That sounds silly, perhaps, but I love jewelry. 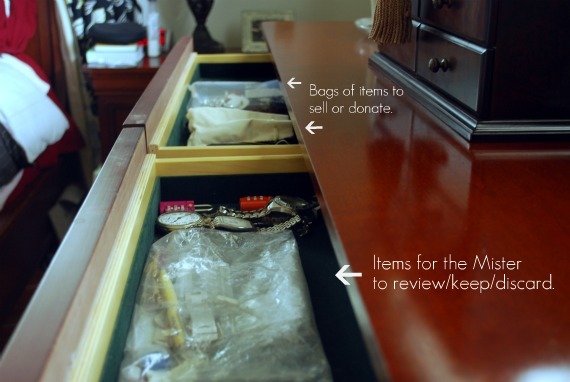 I haven’t bought any in a while because I didn’t want to add to the clutter, not realizing that if I did a simple, 45 minute purge I would have plenty of room for pieces I would use� and love. This project isn’t about living at the bare minimum like some Russian prisoner, scooping out thin grewl from a wooden bowl with a day old piece of bread crust. Nor do I anticipate whittling down my possessions to less than 100 items. Thanks, but no thanks. This is only about creating in an intentional home and living an intentional life. I like jewelry, so I will continue to buy jewelry–from now on I will be more conscious of getting rid of jewelry, too. The vase in the first picture was the first thing I got rid of. I bought it years ago and had it on a sideboard we later sold. I felt guilty for not using it, so I moved it into the bedroom. I never liked it (I bought it 7 years ago when I thought I could live with aqua in my house) but didn’t want to admit I wasted money. I put it in the sell/donate pile today. This project is about owning and moving past your mistakes, too. This post was part of The William Morris Project, a weekly series that details the steps I am taking to create an intentional home. You can see more of my goals and completed projects here. To learn more about this project, start here. Now it�s your turn! 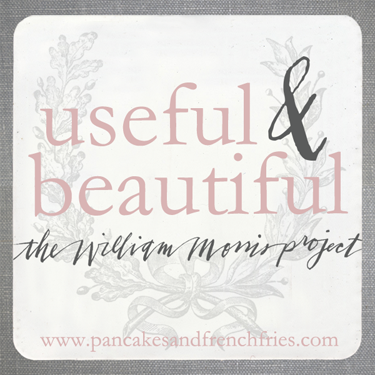 Feel free to share how you have lived according to the William Morris quote, �Have nothing in your houses that you do not know to be useful or believe to be beautiful.� Made a plan? Cleaned a drawer? Bought a sofa? Tell us about it with a link or comment. Please link to a specific post, not a general blog address. Your post must relate to your efforts to create an intentional home. No links to giveaways, please. A link back to this site is always appreciated. There are buttons to add to your post or sidebar, too, thanks to the lovely Alex, of Type A Calligraphy. Just copy the code and insert into your blog post or sidebar while in html mode. Let�s use this weekly link up as an opportunity to gather inspiration and motivation. Click links. Discover new people. Say hi and good job. I know I will. That’s how I was. I started reading all these simplicity books and felt like I could never get there, that it wasn’t something a family with young children could do. Now I’ve read even more books on the subject and realize simplifying just might be something a family with young children must do. Cannot believe you did this – I did it last week too but haven’t written my post yet! I also threw away a ton of stuff, came up with a large donation bag, and felt great about the purge. 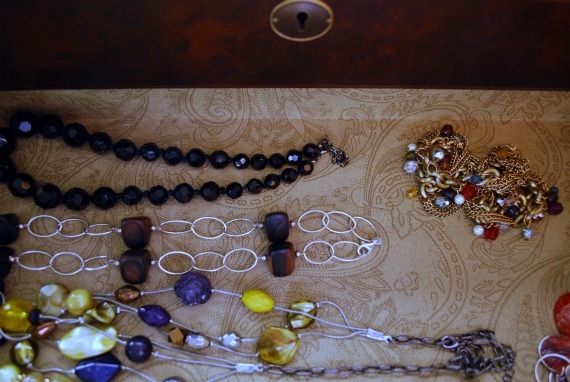 I “discovered” some jewelry I’d mostly forgotten about and took the time to clean it – feels like I went shopping. My post will be coming next week. Thanks as always for your inspiration! I did the same! I found a necklace I keep forgetting about. Score. do try MUJI, they sell the most beautiful organizers for jewelry. I will, thank you! They always have such lovely items, I’m sure they’ll have just what I’m looking for. As always, congrats on a job well done–and thanks for the inspiration! Not only do I need to tackle my jewelry box, I need to clean my silver (also inspired by one of your posts–I just haven’t done it yet. Wretched luck.). Have fun! I think you’ll really like cleaning jewelry my way since it doesn’t require that much work–unless your silver is suuuuuper tarnished. By the way, the second link in that last paragraph isn’t working. I fixed it, Pamelotta. Thank you! 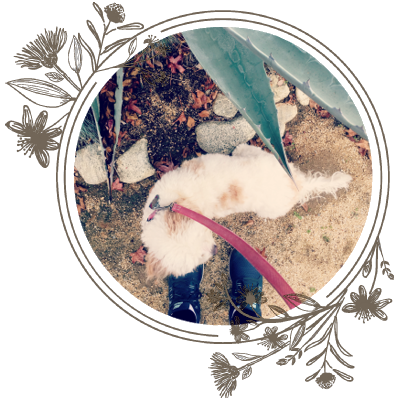 I failed at adding the pretty new buttons to either my post or sidebar. Are others having trouble or could it possibly be operator error on this end? Love the Wm. Morris project and want to spread the word! Thanks, May! Let’s figure this out. Are you in html mode when you add the buttons? When I tried it in the post I was in html. I tried both versions of the button but just kept getting a square with a ? in it. So, then I tried to just make a widget in my sidebar. Same result. I tried again just now and still had the same result. I will keep playing with it because I really want to promote the project. Please tell me any wisdom that you have! If you’re on a mac you can even drag and drop the icon into your post…which has reminded me that I forgot to do this…must update post. This is so so good. 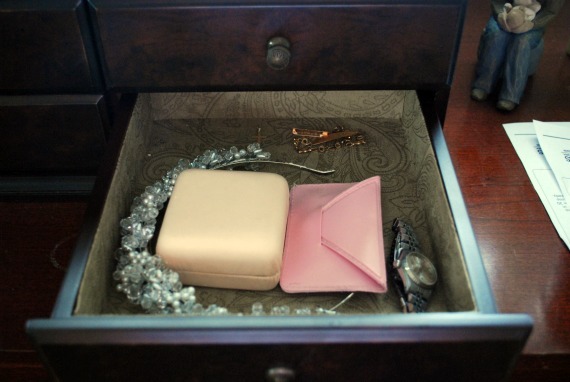 I’m now realizing that I haven’t even opened the jewelry box on my dresser in years now. 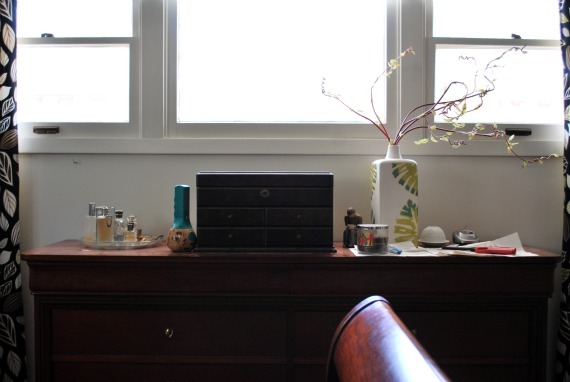 Everything I use is downstairs in the guest bedroom, closer to where I get ready in the morning. This weekend I join your cause – it’s time for the useless stuff to go! Also, I quite like all your turquoise. I love seeing the progress!! It so inspires!! School vacation week is coming…time for me to get organized! I can’t wait to see what you tackle. Good luck! I am curious though, do you keep silver jewelry in plastic bags? A jeweler once told me to do that to prevent tarnishing. Has anybody else been told to do this? How odd about the top drawers? What a flawed design, I’d probably be there pulling on them like some crazed neanderthal until the whole unit collapsed. 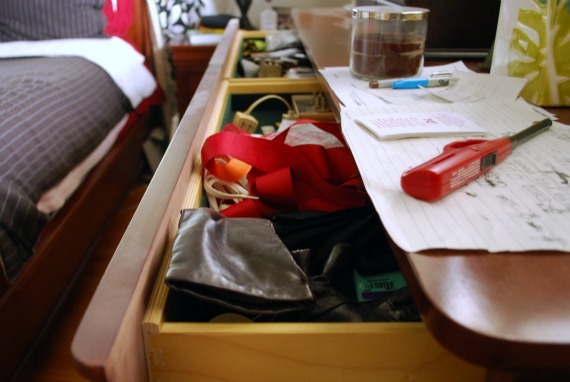 Love the organized, cleansed drawers. Beautiful. Good work, Lady! Trust me, I’ve almost torn that thing apart trying to force them open. They are so weird! 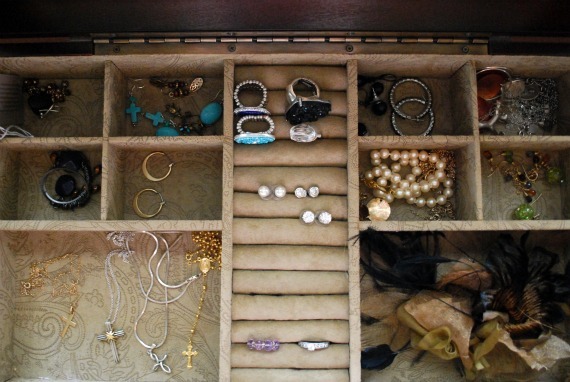 I am inspired–I should add my jewelry drawer to my list, as well. 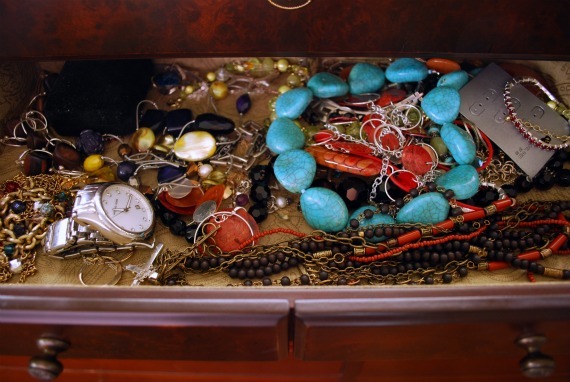 I keep all my jewelry in a similar skinny top drawer. 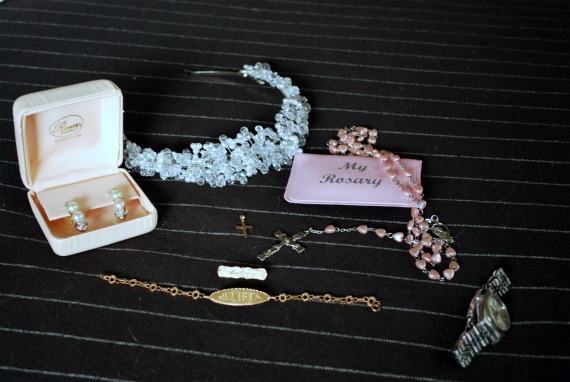 I used plastic silverware holders for the necklaces and a shallow plastic jewelry holder bin for the earrings and rings. It works pretty well, except for the fact that my husband also uses that drawer to drop all his end-of-day junk and medicines in. In order to find my jewelry i have to dig through layers of medicine bottles and gas station receipts. I like the concept of having one of those hanging corkboards where you hang each necklace/earring on its own, so you can see at a glance everything you have, but our bedroom is 11×11 and I have nowhere to put it. I don’t have room to hang a cork board thing, either. I don’t like everything on display, but I don’t like my necklaces laying flat, either. I saw something cool at Mathis Brothers (I think it was there) that combined both. It was a mirror that you hang, and it opens like a medicine cabinet. Inside you can hang your necklaces and earrings, etc. I have been avoiding the jewelry purge like the plague. I have no idea why it feels so overwhelming. I think because I have quite a few pieces that I never wear but can’t part with for sentimental reasons. 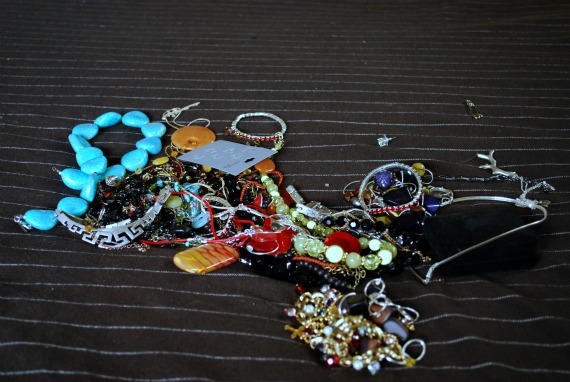 That, and the sheer volume of junky costume stuff and broken stuff … okay I’m of to tackle my jewelry. I’ve been avoiding it for years, so I know EXACTLY what you mean. Now I want to buy a pretty new necklace (or two). Agh! Question for you re: book club. I apologize if you’ve covered this already, but are you going to announce the next book soon? I’d like to put the book on hold at my local library. I flew through Rules of Civility and in the meantime I’m steaming up our windows by reading Dreamfever. Thanks for that recommendation….is it hot in here? p.s. I read your comment at Sprouts while I was shopping for vitamins with Nicholas. I laughed out loud when I got to the Darkfever part. Nicholas was all, “What’s so funny, mama?” And I mumbled something about a girl liking a boy and it being funny. In those drawers, that I couldn’t dump out because they don’t come out (??!!) were several window bolts and keys. Completely random assortment of garbage. I just checked out the banners, and for some reason the little quotation marks are duplicating themselves when I copy and paste, so I suspect that is happening on everyone else’s end, too. Just take out the duplicate quotation marks in the code, and it should be fine. If not, let me know. I’m working on rewriting the code right now. It’s probably because I copied and pasted into the post instead of writing it from scratch. Beautiful jewelry and jewelry box. I need to do a cleanup of my jewelry as well and giving it to people when i visit south america next month. Last night I had had enough of the space under out sink. It is NOT a beautiful space by any stretch of the imagination. However, items were constantly falling out because stuff was just shoed in there. Does any family really NEED 35 brown paper shopping bags? Especially when they have resusable ones? NO! I’m glad I cleaned out under there. Now I can see when I need more dish soap. PS. – Your duvet in your bedroom looks like mine. It’s a Ralph Lauren (Greenwich Modern – ours is in brown) pattern right? Actually, that’s a Thomas O’Brien duvet for Target! Can you believe it? I can’t. I’ll probably be getting rid of it eventually, even though the quality is actually quite good. Duvets aren’t good for allergies. Hi! I love your blog and your writing and the WMP! I’ve been reading for a while now but never felt compelled to post until now. My family was robbed a few years ago and the only thing taken was the jewelry. 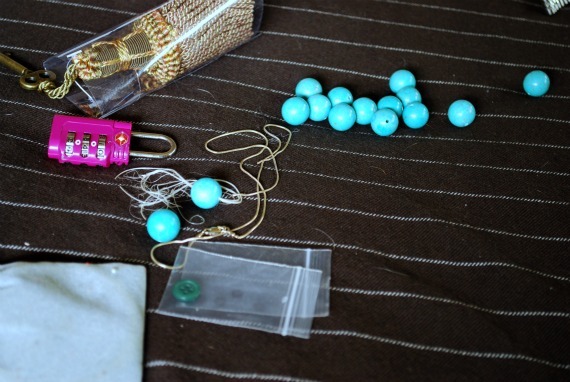 The police told us that jewelry is easy to steal because everyone keeps it in the exact same place – the top drawer. My concern with this post is that it reveals so much information… You show exactly what jewelry you have and where it is in the house. I don’t like to be so negative about this series because it’s awesome, but I just felt I needed to throw that out there. Jewelry is a tough one. I did a purge last year, but I think I wasn’t ruthless enough. There are still quite a few pieces that I haven’t worn since and probably never will. 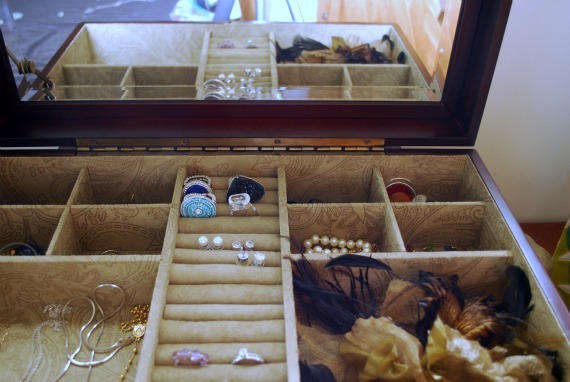 Before we moved I bought a few jewelry trays from a modular system that the Container Store has. They have served me really well. You may want to check them out if you want to go that route. Have you tried opening the second drawer and then opening the top drawer to see if it comes all the way out? I have this vague memory of dealing with a dresser like this a long time ago (or maybe I saw it on antiques roadshow?). Anyway just a thought I had. I have read your blog for a few months now and love the WM-project! It has really inspired me to tackle a few problem areas in my house (wich I didn’t take photos of…). A few days ago I weeded out my computer – there was a lot of unnecessary stuff accumulated over the years (files, e-mails, favourites in my browser). Thank you for the inspiration! the best I’ve discovered till now. But, what inn regards to the bottom line?